Join us May 3–5, 2019, for the Stockholm Writers Festival, an English-language gathering of writers, authors, and industry professionals. Our aim: Give writers the opportunity to hone their craft, learn the business, and join a community of established and emerging authors. 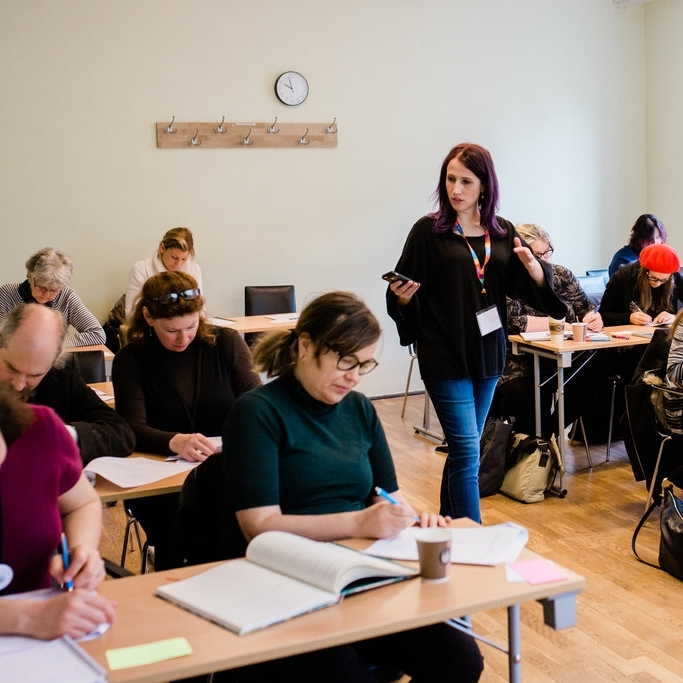 Regardless of where you are in your process, just starting out or finishing your manuscript, Stockholm Writers Festival helps you find your path to published. We’re thrilled to announce industry powerhouse Jane Friedman as our keynote speaker at #SWF19. This is her first time in Stockholm. We’ve seen her at other events and she delivers unforgettable classroom and keynote experiences. Please note: To purchase additional sessions, you need to first purchase the Main Festival Pass. We’re bringing back some of our favorites from 2018. And featuring new authors and agents from the US, the UK, and Sweden. Below are just a few. Check out the full lineup! Jane Friedman has twenty years of experience in the publishing industry, with expertise in digital media strategy for authors and publishers. She’s the cofounder and editor of The Hot Sheet, the essential publishing industry newsletter for authors, and the former publisher of Writer’s Digest. Jane’s newest book is The Business of Being a Writer. In collaboration with the Authors Guild, she wrote The Authors Guild Guide to E-Publishing. Cassie Gonzalez is a creative writing fellow at Emory University in Atlanta, Georgia. Cassie holds a master’s degree in creative writing from the University of Oxford. Her work has been featured in several literary journals including the Kenyon Review. Her play REX has been published and staged throughout the United States. Jess Lourey (rhymes with dowry) is an Agatha, Anthony, and Lefty nominated author best known for her critically-acclaimed Mira James mysteries, which have earned multiple starred reviews from Library Journal and Booklist, the latter calling her writing “a splendid mix of humor and suspense.” Jess also writes sword and sorcery fantasy, edge-of-your-seat YA adventure, magical realism, and feminist thrillers. Paul McVeigh’s debut novel The Good Son was shortlisted for The Guardian’s Not the Booker Prize. His short fiction has been published in journals and anthologies and been commissioned by BBC Radio 4. Paul is cofounder of the London Short Story Festival and Associate Director at Word Factory, the UK’s leading short story literary salon. He is a reader and judge for national and international short story competitions. Finlandshuset, located at Snickarbacken 4, is nestled between Stureplan and Hötorget in downtown Stockholm. It is a jewel box of a venue and promises to help deliver an intimate, content-rich event for #SWF19.